How do I change the color for different detail line types? 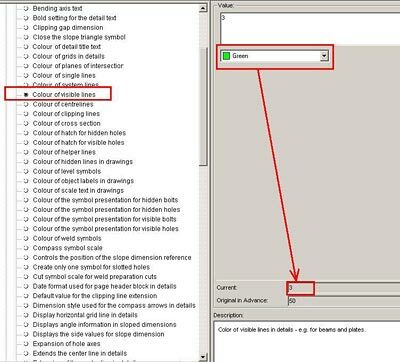 In order to plot different line types with specific line weights, AutoCAD® uses a plot style editor in which we can assign line weights and line colors. B) Go to the Drawing-Presentation group. C)	There are multiple defaults that control different line types (visible line, cross section, helper lines, level symbols, etc.). 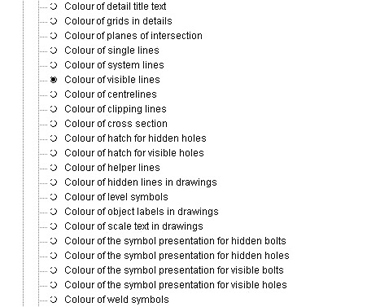 D) Select one of the color items (e.g., color of visible lines). E) Change the color using the drop-down list. Then, click in the "Current" box for the new color to take effect (the value in the current box will change from the original color (which in this case was 50) to the new color value). F) Update the changes in Advance Steel using the Load Settings in Advance Steel command.